This year started out on a Tuesday, when I picked up Rich Johnston and Brenden from the airport, stopped for ramen, and dropped them off at SDCC. I grabbed Jordi3 and Jim (old friends from Dumbrella crew) and we hit up the San Diego Hacker Drinkup. 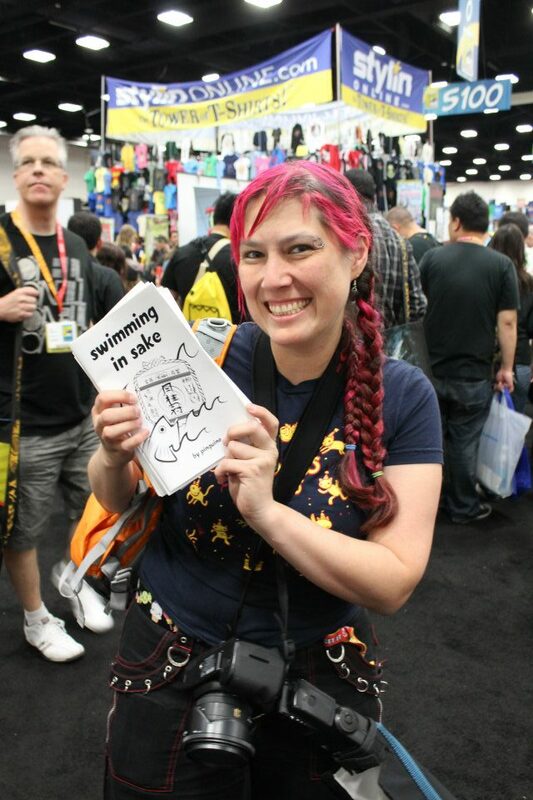 Wednesday was spent running back and forth to a local printer I found, to get “Swimming with Sake” ready for ComiCon. I was printing 500 copies to give out at the Sawdust Press booth, but the printer ran out of the paper stock I needed. We compromised with what he had available. I also went to Diana Greenhalgh’s Drink and Draw lunch, and hung out with a girl who won a trip to SDCC by being Australia’s Biggest Geek. The book was ready an hour after the con started, which I dashed over to its booth. Then I did a shoot of a Legendary Entertainment press event at their booth. As I left, I got pics of the LIVE SNAKES at the Indiana Jones booth. After that, I hung out at the Comic Book Resources yacht for our company party. We were staying at the Mariott, but since I checked in late, they upgraded me to a larger room with a balcony. Our view had both downtown and the harbor, and it was amazing. I was sharing a room with Sabrina, and through the week a variety of people came by to crash for a night or two. Randall and a honey badger win for being the most random visitors. On Thursday I was in panels and press rooms all day (Thanks for lining up awesome things for me to shoot, Remy). I got to meet Tokidoki, one of my favorite artists. Also shot Psych actors. After the con I stopped by Tr!ckster to say hi to Count Ninjula and eat a food. Then, I shot a Heavy Metal party, which was also party for Agent 88. Agent 88 is a web series that my friends have been working hard on, about an 88-year old secret agent. I met the actress who plays her, and she’s awesome. She decided she wanted to be an actress at like, age 80. Badass. The party was probably my favorite ever. It was in a haunted house!! The drinks had dry ice. The music was pretty good. A lot of my friends were there, so that made it super awesome. About half of them I know from deviantART. Made friends with a vodka girl, which would be my downfall for the night. Also got a special Agent 88 toy! The only drawback to the party was that it was incredibly sweltering hot. We hung out in a dungeon part of the night because there was an a/c vent. A smaller group went partyhopping after that; DJ Headshot (Kyle), Dekker, and Boris. I think we were at a Geek and Sundry party (Joss Whedon was there, as well as Shelf Life‘s Yuri and Tara), Kings of Con, and Hyatt. Friday I shot Kevin Smith at 10a, and I think neither of us were particularly awake. I was in and out of pressrooms, and ran through the Firefly reunion panel. Shot the Locke and Key guys getting a special thank you present from IDW (a giant axe). Did a private shoot with a well-known bellydancer named Sabrina. At night I shot the Walking Dead red carpet event, which was a lot of fun since I really like the show. The event was fairly difficult for me to find, but once we got there, zombies were running around and some fake cops rounded them up and put them behind a fence. I got to shoot some of my favorite actors from Walking Dead, Lost, and Heroes. After that, I met up with Dekker, Dave, and Kyle over at Tr!ckster. Count Ninjula was doing a fantastic job DJing, and Eric Calderon was doing live art with ketchup. Tried to go to Thrillbent but the fire marshall wouldn’t let us in. Ended back up at Tr!ckster and Hyatt after. I think this was the day we had incredibly yummy pizza at 2a. Saturday was nuts. Had a super delicious breakfast with Michael and Dave at Mariott and Masi Oka from Heroes was at the table next to us. This might have been the day when I shot the Iron Man Kid’s Costume contest from UNDERNEATH Access Hollywood’s video camera, and Robert Downey Jr showed up. So much adorable. (Thanks for the tip, Melody!). I also shot William Shatner. Damphyr saw me and made sure I took pics of John Barrowman. 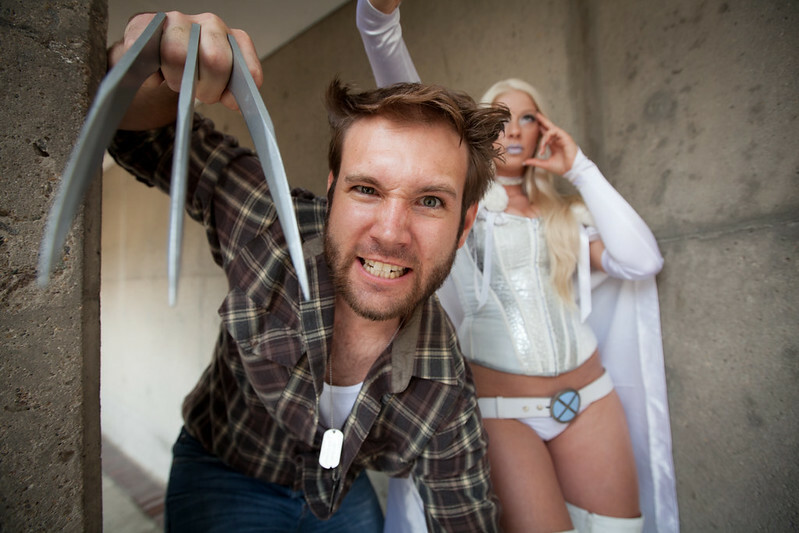 My friends hired me to do a cosplay photoshoot, so we did that- White Queen and Wolverine. They were fantastic and it was a lot of fun. We had a bunch of photo assistant volunteers for that one, and it was really nice to actually be able to focus on excellent photography over the opportunity of the moment. Dekker was up at a party hanging out with Elijah Wood, but came down to hang out with Kyle, Michael Lim, and me over at an NBC event (yummy taco bar and cute desserts!). We went back up to his event, but it was winding down. 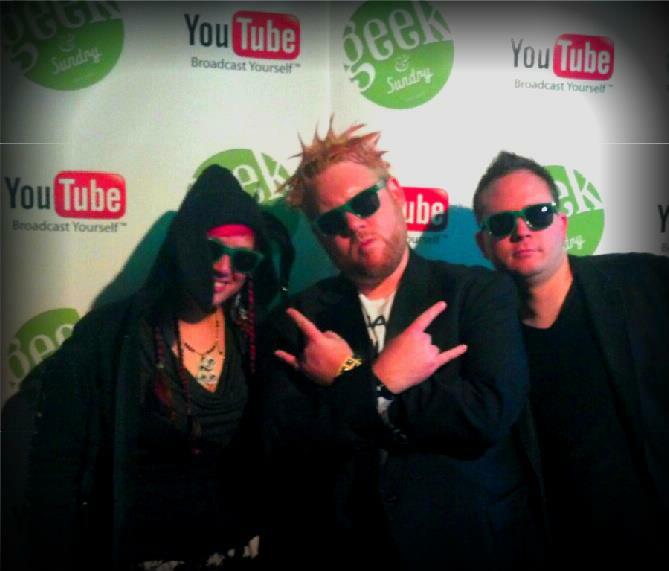 Then, we went to a YouTube party and ran into a bunch of people from Guild (and my friend TJ!). After that we went to .. blanking on the name but it’s kinda like a flashmob and con party at the same time. It was at a bowling alley. Chilled with Emmett, Chris and Elodie (the cosplayers from earlier) and Ryan. Then we ran over to the Hyatt where pretty much everyone at ComiCon was at, but we detoured to run around at a playground. 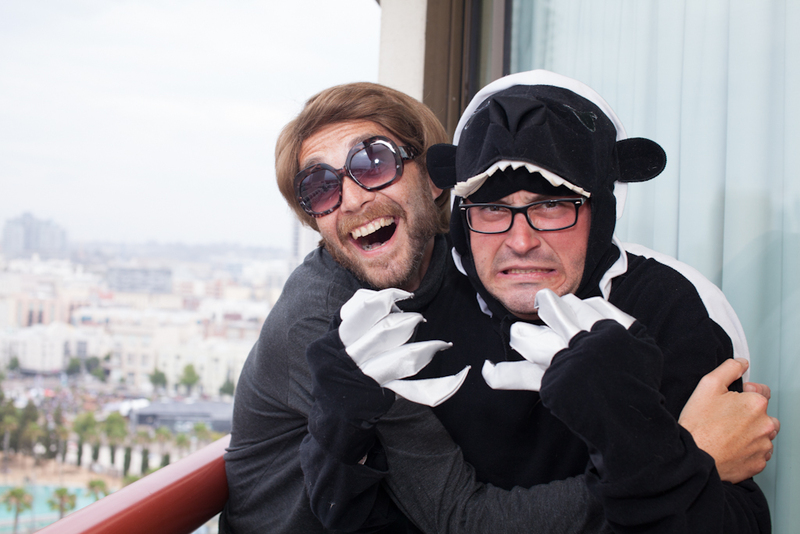 Then we grabbed David Marks and woke Rich up and a party happened in my room that turned into a balcony party. Somehow, I was awake and running around Sunday. Dropped the remainder of the comics to Sawdust Press. The best part was going into Hall H and Matt Smith mentioning the best part of ComiCon was the costumes and (while looking at me shooting him) colored hair. I actually watched the whole panel, which I rarely do. When I left the Hall, it was a very surreal sea of fedoras, so I cut around the backside of the convention center to get back in. 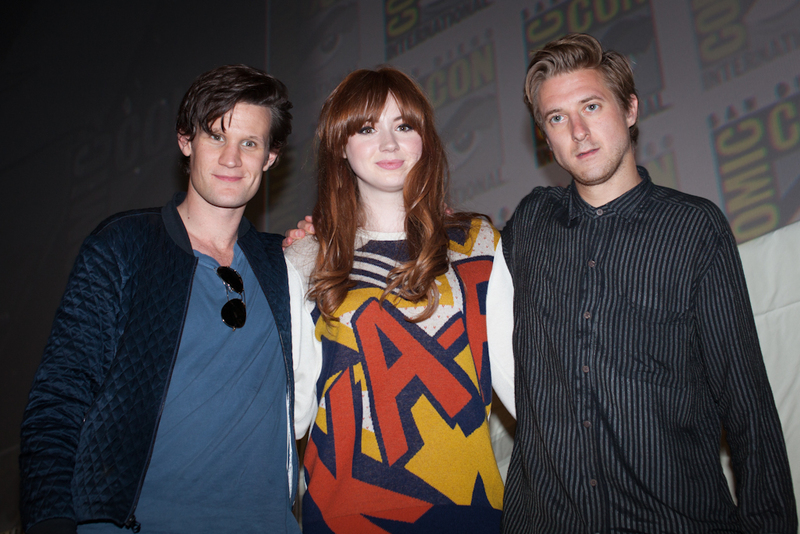 I got introduced to the Doctor Who cast and got better photos. Michael Lim found me in the late afternoon when I was fairly delirious and exhausted and wandering Artist’s Alley, and made sure I got water. We grabbed Rich, Brenden, and Kyle and hit up Pokez, which is my favorite restaurant downtown. Delicious! I think that pretty much sums up Comicon this year. I actually had a ton of fun and was WAY WAY WAY less stressed out than most years. Staying close to the convention center helped immensely, and so did this new photo backpack I was rocking. Here are all my Photo Parade articles!! As always, my best work is here. Yay! Check them out. Also a few people said nice things about Swimming in Sake!